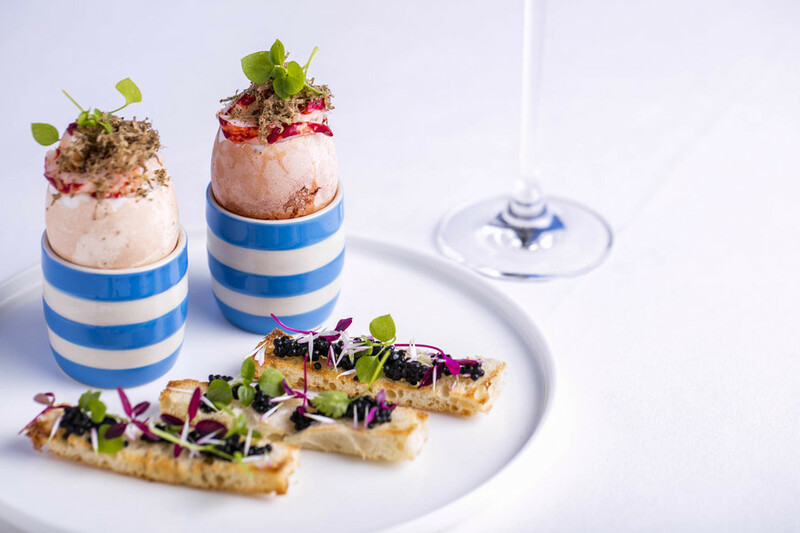 Lobster-topped boiled eggs with caviar-topped soldiers: did we mention Skylon's a bit extra? The views across the river. The rich, luxurious spins on modern British dishes. A staff count that seems to translate to roughly one — unruffleably charming — waiter per diner, and a sense of calm serenity across the large dining room... Skylon has a lot going for it on even an average day. But Saturday brunch now comes with all of the above, and some bonus saxophone. The Skylon Saxy Brunch — their name, not ours — offers bottomless prosecco, two courses from the brunch menu and a backing track of live jazz. The music's a nice extra, and volume levels are mostly decent — definitely-there meets not-intrusive. The saxophonist drifts in and out of view behind the restaurant's central pillars. If we're honest, the music feels like something of an afterthought or a hook to set this brunch apart from bottomless brunch-saturated London. Not really needed: the food does that on its own. 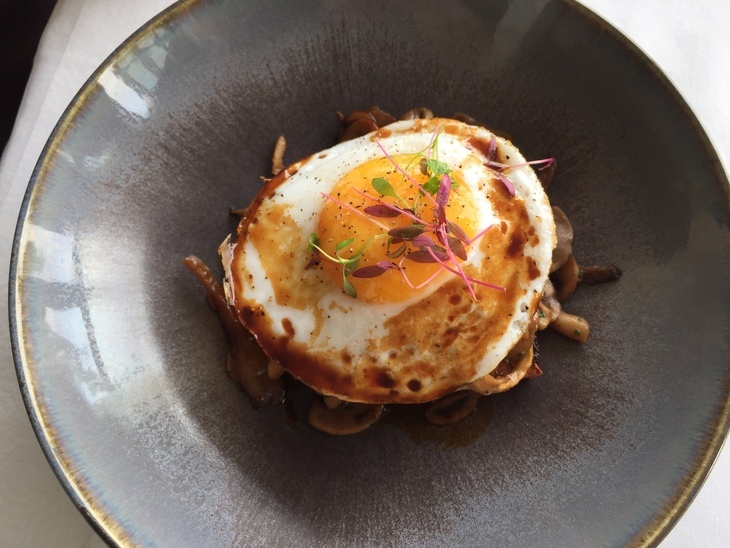 Our starters would make for believable brunch mains, both in size and richness: toasted focaccia comes topped with wild mushrooms and a fried duck egg, the bread turning heavy with mushroom juices and thick yolk. Soft-boiled eggs and soldiers get the Skylon treatment, the eggs topped with lobster and the soldiers sprinkled with caviar. Our mains are along similar lines, traditional dishes with the richness dialled up: fish pie with a thick cap of buttery mashed potato in crusty peaks and creamy ravioli scattered with toasted nuts. The soft-boiled eggs starter is utterly beautiful, but the pieces of lobster are on the rubbery side, the caviar a hindrance to the soldier-dunking — we find ourselves craving the un-jazzed up version of the dish. That's the only dish that delivers a bit less than it promises, though. The fish pie, wild mushrooms, springy focaccia are all on-point, and if it starts to feel halfway through like an outrageously heavy way to start the day, the advantage is all that opulence makes the bottomless prosecco a bit less dangerous. Our stomachs are thoroughly, impermeably lined. We witness a large-scale drink-spillage and get a chance to see Skylon's charm-army whipping into action — waiters and hosts appearing in a flurry of tablecloths, fresh glasses and assurances that it's not the slightest problem. Between the views, the service and the food, it doesn't take a jazz offering — nice, but slightly sidelined — to find a reason to visit. The Skylon Saxy Brunch menu is £35 for two courses and bottomless prosecco. It runs from 11.30am to 2.30pm every Saturday. Skylon, Royal Festival Hall, SE1 8XX.